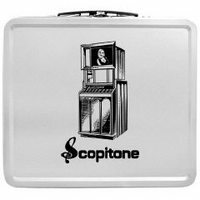 Scopitone T-Shirts and LP Tote Bags! Check out our new Etsy Shop. We've got Scopitone T-Shirts for guys and gals and tote bags too! (You can fit about 20 LPs into one). We've also got some other interesting music and vinyl related designs and many more to come. Click here to be taken to the Scopitone Merchandise store At Cafe Press where you'll find a full compliment of doggie t-shirts, thong underwear and more!